Hi all can some one please help me with this error code its in win-avr,i try to compile code and i get this error quite alot,ime a learner to code etc so try explain as much as possible,i take its somthing to do with the version ime using? Silly question but why ARE you using a compiler that is 6 years out of date? 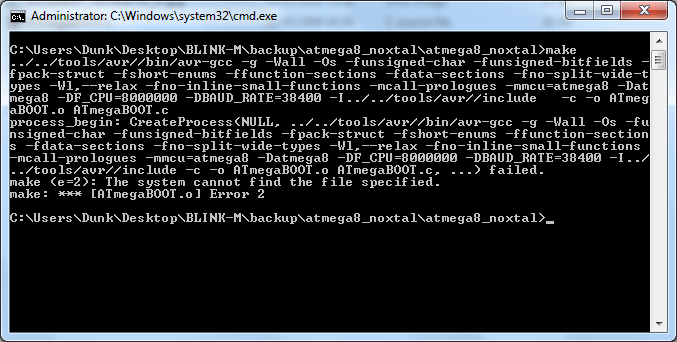 Anyway, it seems to be saying that there is no avr-gcc at ../.. from where this code is running. Is there? Hi theusch,what you mean cc do you mean gcc,ime a noob as they say and havnt a clue as to what ime doing,ime trying so hard to get my head round all this stuff,ive only just learned how to compile source code from the cmd line well sort of by fluke ,i dont know how to install avr-gcc i have downloaded it but get a load of files,what do i do with them? they are bellow? ive not a clue what to do with these files,how do i point my code to it and use it. Also how would i point source code to say arduino avr install files,somtimes ive code that needs the arduino toolchain files to compile.also if i download win-avr portable versions and put them on usb how do i get code to compile from them,instead of uninstalling the latest verion and installing the older version to compile the older code,as ive code that needs differant versions of avr,older versions,is there any way of makin the code use a differant set of make avr versions? Ive a million quetions about all kinds of problems ive come across but i dont know a single person who will help me,and i dont know any one who is into this kind of stuff,it would be far more easy if i had some one sitting next to me and i could bounce my questions of them and they could show me how to compile avr code without bloody errors all time,its so stressfull,i love this kind of stuff but ime just hit with brick walls all the time,i feel like packing it all up. Arduino is crazy too,i have tones of code that wont compile as it needs a sertain version that it was compiled with,ive insalled about 15 versions of the ide so i can compile most code that i find,its stupid how they keep changing things with each ide,how are noobs ment to learn,there should be just one standard and stick to it.it drives me crazy.I can belive i been using win avr thats 6 years old,when i downloaded it it says the latest,it didnt say it wasnt updated anymore now ime wondering what am i supossed to use,avr studio 7 wont install on my pc,i get install error codes again whats new story of my life. this is my path and whats in it,am i missing somthing? Your path looks fine, but your makefile is trying to access the compiler at a hardwired location ../../tools/avr/bin/avr-gcc instead of using the path. This is an Arduino bootloader, perhaps? Some of the makefiles for those are (might be?) set up to use the compiler that was included as part of the Arduino distribution, and are therefore dependent on having the working directory be at the .../hardware/arduino/bootloaders/xxxx level. (Although, not any of the ones included with the Arduino distribution. Exactly what code are you trying to compile? 1.0.6: last pre-ARM version; lots of code written for this version. 1.5.8: last "beta" version with ARM compiler. Stable, but not particularly recommended. 1.6.5: latest "stable" version - newest C compiler, "board manager" and "library manager". > 1.6.5: new and slightly risky. I still use that compiler, (have an old project that started with that), in many cases it make better code that the newer ones. I use it from AVRstudio 4 (4.18), and have it marked as an external tool. I have had no problems. I put the text of your message into Google, and many pertinent hits came up. I am a "newbie" with WinAVR. 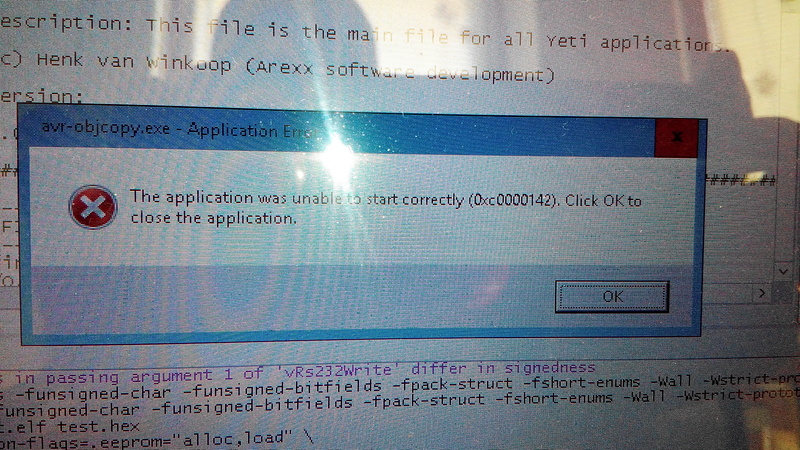 I need to use it with my Yeti-3000 robot from Arexx, but when trying to compile the file I get an error "avr-objcopy.exe - Application Error" (a screen capture is attached). I am using WinAVR-20100110 under Windows 10. Please, did someone encounter this already and also has a solution ? Thanks for advice. I know about Atmel Studio, I installed it, but it looks that files of type ".pnproj" are not within the types recognized by Atmel Studio. I am still trying to use WinAVR since it is indicated like this within the instructions from Arexx for my robot. The instructions are from 2015 and I have no idea why they preferred WinAVR instead of Atmel Studio. That's to explain my need for help. PNPROJ is "Programmers Notepad Project". Programmers Notepad was an "IDE" that was just a small step up from using Windows Notepad that used to be popular 15+ years ago. This is 2017. No one uses Programmers Notepad as an IDE in this decade. At the end of the day any avr-gcc project is just some .c files, some .h files and a "makefile" that explains how to tie them all together. You can easily use these things in any modern IDE or simply by building the code at the command line using the "make" utility. You will be creating a pretty steep uphill struggle for yourself if you try to get all this old stuff working. Get a modern compiler and a modern IDE and you will have some hope of finding someone who can support your use of it. I doubt anyone here has actually used Programmers Notepad in 5+ years! It appears they supply "makefile". So you don't need to use the .pn* files. You can use that Makefile with most IDEs or, like I say, build at the command line.